EG Production presents BE A PART OF HISTORY! 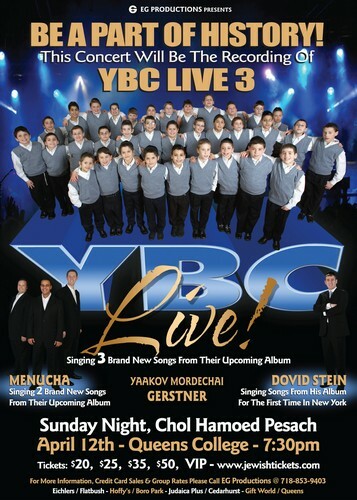 This concert will be the recording of YBC3. YBC Live! singing 3 brand new songs off their upcoming album. Menucha singing 2 band news songs off their upcoming album. Dovid Stein singing songs from his album for the first time in New York. Sunday night-Chol Hamoed Pesach April 12th – Queens College – 7:30pm. Tickets: $20, $25, $35, $50, VIP. To purchase tickets please visit JewishTickets.com .